Hooked on Needles: Friendship Bag - Fun and Cute! Friendship Bag - Fun and Cute! If you have been following Hooked On Needles for even a short time, you probably know that I love bags, all kinds of bags. I love to make them and I love to receive them and I love to use them for all sorts of things. You may have also noticed the cheerful little Friendship Bag Swap button on the sidebar of my homepage. It was an opportunity I could not pass up so, you guessed it, I signed up! This week, I started sorting through fabric for a few upcoming projects, and this was one of them. I settled on what I thought was a fun combination. What do you think? If you recognize the black and white fabrics, that's because they are the same fabrics I used for the pin cushion bag I made for my sister. 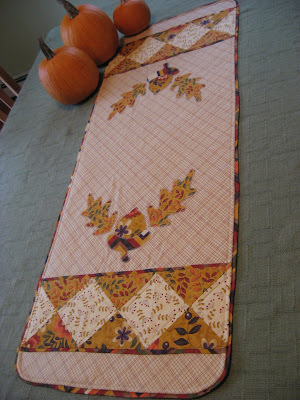 But then I threw in a few colorful fabrics from my recently filled out fat quarter stash! There were two patterns offered by the Friendship Bag Swap hostess. The bag on the left was made using Rachel's Friendship Bag Tutorial. The bag on the right with the kicky little pleat on the edge is Kim's Charmed Gift Bag featured on Moda's Bake Shop. This bag was fun to make because I got to use my walking foot to do some machine quilting of the outside layer and the batting before assembling the bag. I love the combination of black and white fabrics with the colored fabrics too! This little charmed bag was so quick and easy to make, I just couldn't believe it! And if you make bags with boxed corners, you really should check out Kim's tutorial showing how to box the corners of the outside and inside of the bag at the same time! It's pure genius! Both of these bags are about the same size finished, which is quite small, about 5 x 5 1/2 x 3 inches. Just big enough to put in a charm pack or two, a jar of homemade jelly, some little scrapbooking supplies, a ball of yarn with a pattern and crochet hook, a crocheted washcloth and a pretty handmade soap or some hand lotion, a few fat quarters and some lace trim. The possibilities are endless. Now I need to decide which one of these cute little bags I will send to my secret Friendship Bag Swap partner, and which one I will keep for myself! Decisions, decisions! Too hard to choose! They are both very cute! Keep both and make another for the swap! There, problem solved. I really dig these bags! do you have a store in etsy where you sell these things? I received an email recently with a free crochet pattern and fell in love it so I downloaded it.. I'll email it to you. I bet your daughter would love it! Oh that would be way to hard to choose, I would just close my eyes and touch one, then give away the other!!! They are so sweet! I love black white and red together too. 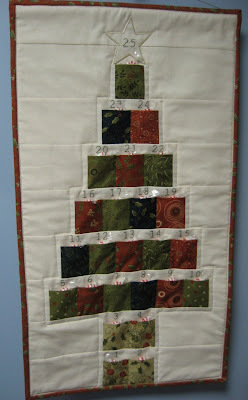 I wish I had friends that quilt so I could make them for gifts! Nice job. Recycled Jeans - A Drawstring Bag This Time!